U.S. Senator John Boozman visited Sheridan today, Nov. 30, to learn more about the Sheridan School District's partnership with Kohler, a local manufacturer based in Kohler, Wis.
After touring the Kohler facility, Senator Boozman toured the Sheridan High School Addition construction site, which will be the home of Sheridan's Kohler Academy. For the past several months, the district has been working with Kohler to develop curriculum and build a career pathway that will prepare students for careers in manufacturing. 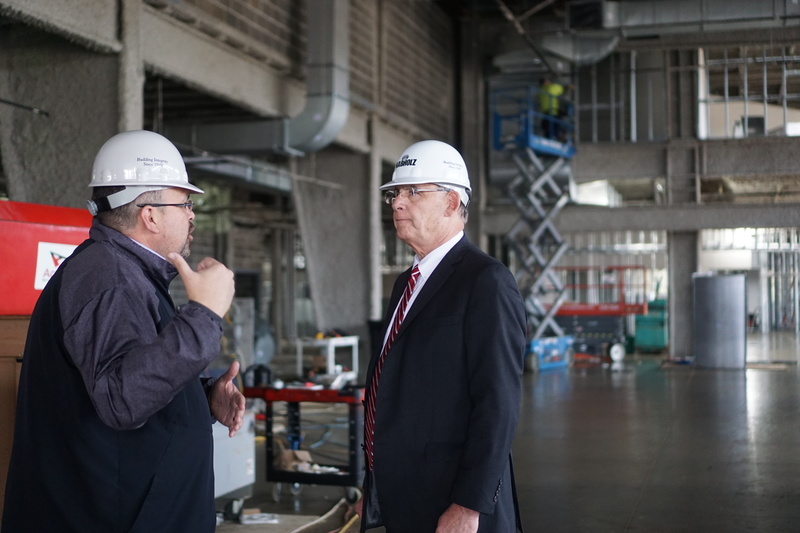 During the tour of the new high school addition, Senator Boozman said that Sheridan is leading the way in partnering with private industry to provide students with the tools they need to be successful. "I think this project is a great example of the community, private industry and the state coming together for the common good to make it such that we can provide our students -- our young people -- with the skills they need for the future economy," said Senator Boozman. "It's very impressive, and it will be something everyone can be very proud of." The Kohler Academy will feature a Kohler Robotics Lab with equipment actually used in Kohler manufacturing plants. The academy will consist of two career pathways: computer-integrated manufacturing (career track) and engineering (college track). Students who take the manufacturing track will receive training that will prepare them for a career at Kohler -- or another manufacturing company -- right out of high school. Students interested in engineering will be able to take engineering courses while getting hands-on experience with equipment in the Kohler Robotics Lab. Kohler is donating $130,000 worth of equipment to support the development of Kohler Academy at Sheridan High School. The district also was awarded a grant from the Arkansas Department of Career Education to support the academy.